Man City score a huge number of goals from this area. In the 2013/14 season, they scored 132 open play goals in all competitions; 52 of these were either scored or assisted within these zones (39.4%). One reason that they are successful here is because of the individual brilliance of their expensive squad. But more important is that the system is set up to magnify this brilliance. Despite originally setting up as a 4-2-2-2, initial formation matters little for a fluid attacking system such as City’s. Very little discipline is expected of David Silva in particular, who will often drift horizontally in a bid to find space. It is then up to the rest of the team to adapt to Silva’s positioning. In big games, Manuel Pellegrini has often preferred James Milner to Samir Nasri as the Englishman offers a higher defensive work-rate and tactical intelligence. When Silva drifts inside, Milner understands whether he needs to stay deep and add stability to a potential transition defense, or to hold his position and add attacking impetus. 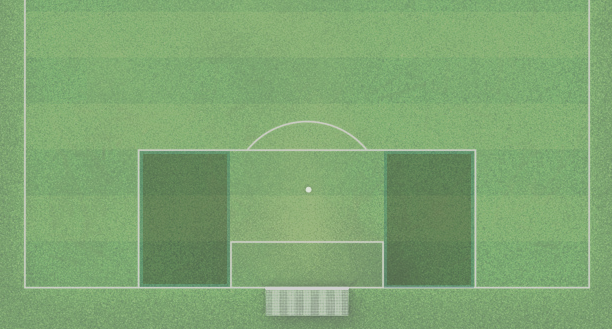 It is clear that City are very well coached at penetrating the penalty box halfspace. It seems as if the players know what each other are going to do before it happens. This is because they do. The manner in which City are able to gain access to the opposition’s penalty area is similar to set plays ran in American sports such as Basketball and American Football. Marcelo Bielsa once suggested, “if football were played by robots, I would win everything”. Pellegrini, a native of the country Bielsa made such an impact upon, would probably think the same of himself. The difference between the two is that Pellegrini now has players at his disposal talented and intelligent enough to create this ruthless efficiency. This is a play run specifically for Pablo Zabaleta, triggered by David Silva being inside of Edin Džeko when the Bosnian received the ball. Zabaleta immediately knew this was his cue to make his run, as it was his job to provide the width with Silva in-field. The ball is then played between central defender and left-back, and makes a first time cross into the middle. It is clear that City are running the play due to the right-back’s ability to time his run. And yet, other clubs appear either ignorant to the ploy or simply unable to stop it. Having this level of automation in the attacking system means that Pellegrini has more control as the coach. The only player who has total freedom is David Silva, with the rest of the team playing around him. All of his teammates have closely defined roles to fulfil, depending on the Spaniard’s positioning. One major advantage of having Silva as the ‘brains’ of the team is that it creates wonderful layers to the attack. Rarely do City have two players making the same run from a halfspace cross, and this means each player provides a different passing option. Sergio Agüero will almost always push to get beyond the last defender when a halfspace cross comes in, and a number of other players have noticeable preferences too. Alvaro Negredo would favour a back-post run, with Samir Nasri and Stevan Jovetic both preferring to arrive late into the box. Edin Džeko is the only player in City’s attack who is capable of fulfilling any of the previous roles. This is why Džeko is often so successful near the end of each season. As more teams attempt to avoid relegation, they push deeper and deeper in a bid to avoid losing the game. 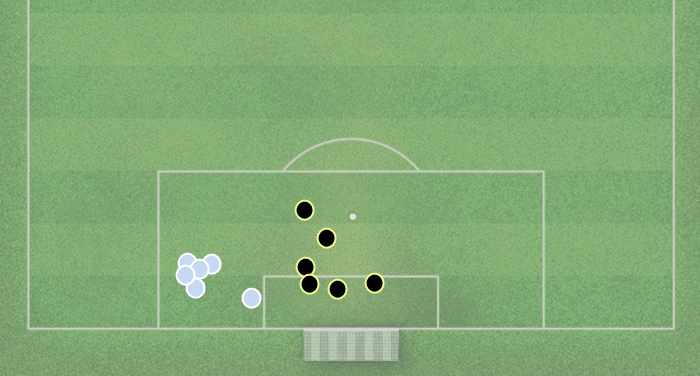 This merely plays into Man City’s hands as their ball circulation is so good (27 of their 39 halfspace crosses came in the organisation phase), and Džeko feasts upon the balls that are whipped in. The latter half of City’s title-winning campaign was a particularly successful one. If it could’ve been symbolised by one moment, it would be Yaya Touré’s surging run against Crystal Palace. Following a dismal collapse at Selhurst Park, title rivals Liverpool had thrown away a 3-0 lead. That weekend, City went on to comfortably beat Palace 2-0. The lead was secured by Touré’s run, which began inside his own half and finished with a curling finish inside Speroni’s post. More recently, Touré has begun finding it difficult to impact on games in the same way. In Pellegrini’s system, it is vital that the two central midfielders are dynamic and able to single-handedly nullify opposition counter attacks. Touré has struggled in this department and often leaves tremendously large gaps between the midfield and defense. This is particularly important to avoid in the Champions League, where almost every team has a player capable of exploiting that space. Kompany steps up into the massive gap left by Touré. This leaves Totti free. You don’t leave Totti free. It is understandable that City keep picking Touré even despite these deficiencies, but only when he is regularly producing moments of individual genius, such as the goal against Palace. This is because his attacking play is largely based upon individual brilliance. His contribution to halfspace assisted goals was incredibly low, with only one goal and one assist for the season. He would often play a role in the build-up, with sharp direct passes into the feet of the frontmen, but this is a role the more defensively reliable Fernandinho and Fernando are able to play. In the attacking mini-game of penetrating opposition halfspaces, Touré plays an insignificant role. Considering this makes up 40% of City’s attacking power, is his attacking contribution so valuable as to make up for his increasingly poor transition defense? That is a question Pellegrini must answer, but whilst he continues to ponder, City will find it increasingly difficult to take a hold of the big games, particularly in Europe. City’s emphasis on attacking opposition penalty box halfspaces is a facet of their game that is undervalued amongst most followers. It is no surprise that Pellegrini rates highly the players who contribute to these plays, such as Edin Džeko and Pablo Zabaleta. Whilst Džeko and Zabaleta may not seem like the stars of the show amidst an abundance of expensive talent, as the top halfspace goalscorer (8) and assister (6) respectively, they are clearly an essential component of City’s multi-dimensional attack. It would not be surprising to see Pellegrini drop certain players who simply don’t contribute to this phase of play.